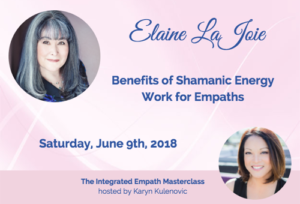 It’s hard for me to believe, but it’s already time for the second season of The Integrated Empath Summit hosted by Karyn Kulenovic! Karyn interviewed me about Shamanic Energy Work and how it can change the lives of Empaths, especially around trauma. I hope you will tune in, especially if you have had questions about Shamanic Work and whether it would be a good fit for you. I’m also excited to report that I will be returning to a regular schedule in the fall, which means a new book should be available in 2019 and I may also be taking more clients and writing more blog posts. Stay tuned–my mentor Marv Harwood, and his wife, Shanon, of the Kimmapii School of Shamanism are coming to Portland at the end of August to teach a weekend workshop, no prerequisites required. More information to come soon. Until then I hope to see you at the Empath Summit! This entry was posted in Creativity, Empathy, Energy Healing, Generational Imprints, Relationships, Soul Path/Purpose, Soul Retrieval. Bookmark the permalink.